Rexel almost wanted to die from the agony that her body was putting her through. She would NEVER again attend that training camp if she could avoid it. Sure she was now able to run almost 3 miles without getting winded but her thighs were burning, her calves felt like they wanted to fall off and her feet were swollen. She was not happy. Still, she forced herself to continue walking, not at all aware with where her legs were taking her until she found herself staring at a familiar door that she hadn’t seen in the longest time. She suddenly realized that her hand was pressing against the handle bar and quickly she pulled away from it. Why had she come here? Maybe she was lonely. She really hadn’t made many friends since coming here. Rina had always been the social butterfly, while she usually was the tomboy wallflower who threw herself into sports. Normally all she needed around was Rina, but with her sister’s infatuation with Kira, she didn’t expect her to be around as often as she had before. She wasn’t angry that Rina had found someone, she knew Rina would never leave her but still. Then there was Aksel. She wanted to keep as far away from him as possible, but wasn’t sure if she would be able to keep hidden from him for much longer. She stood before the door pondering all the issues that were popping up into her life, not even aware that silent tears began to fall down the gentle curve of her cheeks. Friend: I just don't know what I'm going to wear! Nigel was just returning from the Forest of Death and was not feeling so well himself and did not want to be bothered by the children in the hallway. So, he floated along the ceiling in his cloud form largely unnoticed except by a few more observant students who brushed it off as unruly students smoking again. When he arrived at his office though, he started because standing there in front of his door was Rexel. Nigel quickly floated inside the room through the crack at the hinges of the door and solidified himself on the other side. He turned the door knob of his office door slowly and allowed the door to swing open. "Hi Rexel," he said before she visible. "It's been quite a while, hasn't it? Please, come in. Make yourself at home." Nigel's clothes were torn and tattered from his, business, in the forest. "Excuse me while I change into something more appropriate." he said before opening the door his maids usually used and put on clothes that were not torn in any way. He sat down behind his desk that a maid had already placed a plate of milk and cookies on. Nigel picked one up and placed the whole thing in his mouth before offering one to Rexel. Only in their dreams can men be truly free. T'was always thus and always thus will be. Rexel stop and stared for a moment, when he opened the door. She wanted to reply but somehow couldn't get her mouth to work accordingly. When he pulled away to go change she allowed herself to enter his office, and took a seat in front of desk as he disappeared behind the odd hidden door. She wanted to ask why his clothes were in ruins and what lay beyond the bookcase, but stilled her tongue reminding herself that it really wasn't any of her business. When Nigel offered her a cookie, she accepted it with a soft thank you and began to munch on the sweet treat. She wasn't sure what it was she should say. Nigel smiled at her as she took a cookie. They were loaded down with chocolate chips and they were so soft and chewy it was like the baking god had cooked them himself. Nigel stared at her for a few moments before realizing that he was staring and asked her a question instead, "So, what have you been up to in your absence?" Nigel knew that she had gone to camp but, he didn't know how things went or what kind of camp for that matter. It was off grounds and off his islands and so, out of his sight. Rexel shook her head softly, her short black hair swaying from side to side. 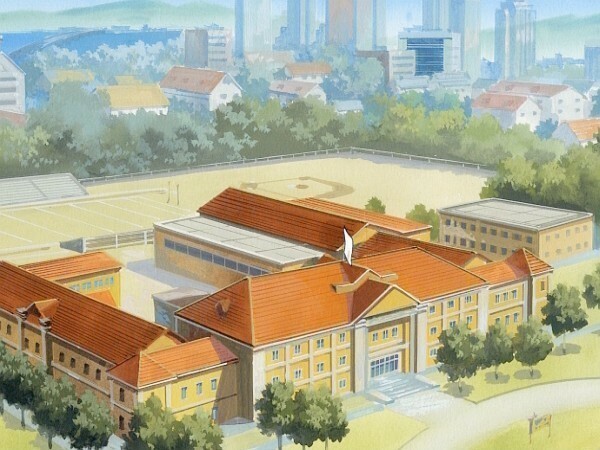 "Well, you know Rina and I went to the track training camp. That was PURE torture." She told him. "We normally attend some sort of extra training every year but after that horror, I'm honestly considering quitting track. That one instructor made me hate the bloody dash." And suddenly she caught her slip up and covered her mouth. "I'm sorry, I didn't mean to curse." Nigel laughed lightly at her story and gave her a slightly confused looked when she apologized for cursing then he remembered that she had come from a different background and understood her mistake. "It's quite all right. Here, we're friends and not Head Master and Student." He smiled her and motioned to the plate of cookies. "Please, don't be shy. Help yourself." Nigel couldn't help to continuously smile at her. "So, you went to track camp. They really ran you hard, hunh?" Rexel scoffed lightly with a smile before bending over and grabbing another cookie. "It was horrible. Every day I felt like my legs would just pop off! I don't think its humane how they run the place honestly." She told him as she munched on the chewy, delicious junk food. "If you fell behind during morning runs, they made you do extra chores and laps." Rex continued, "Poor Rina always ended up with latrine duty." She continued to mutter on and on about the various horrors that they had encountered on their trip, forgetting all about etiquette and status and when she finally realized that she was just talking about utter nonsense she stopped. "I'm sorry," She apologized with a blush, "I didn't mean to bore you with ridiculous tales." Nigel was engulfed by her stories. He allowed himself to be immersed in her words and lost himself in her voice. When she stopped so suddenly he realized that he had stopped eating the cookies and had left the milk untouched. He also found that he no longer needed the chocolate while he was with Rexel. "Oh no. Please, continue. I like listening to you speak. You don't bore me at all. In fact, I believe you've helped me." Nigel spoke without thinking and revealed a small bit of information he hadn't intended to. He hoped she would overlook it and continue on with her stories. Rexel blushed, embarrassed by her disregard for his entertainment and input into the conversation and folded her hands quietly into her lap. "I really don't have much anything of interest to talk about, Mr. Uno. I'm not a very... interesting or eloquent person." She looked down at her lap before turning her gaze towards the window and then back to Nigel. "Is there anything important that Rina or I missed in our absence?" She asked, wanting to find another topic to chat about. Nigel thought about what had happened. [i]Let's see, White has recruited Aksel to his cause, he also infected every one with the evolution drug and people were already starting to show symptoms. "Nothing really. Only if you think you may be coming down with a cold. It's been going around lately. Though, if you do feel you've come down with something, you should come and see me rather than the nurse." Nigel smiled at her like it wasn't the most unusual request he could have made. Rexel wasn't quite sure how to respond to his request. Why should she come to him first? Nigel saw the confusion on her face as she contemplated the strange request. "Don't worry about it. I just want to make sure you're all right." Nigel actually blushed a little as he said this and looked down at his desk. She continued to stare at the man oddly, but munched away on the cookie in her hand still unsure of how to proceed with the conversation. She wasn't a very social person, that had always been Rina's forte. Nigel saw her uneasiness and decided to let her loose. "Well, I'm sure you're anxious to see your other friends again. You can go now." Nigel gave her a smile.